Faith is more powerful than any Disease. Faith is more powerful than the tallest tidal wave, or any force of nature. Faith is more powerful than a thousand hydrogen bombs going off at once, one of which is more powerful than an atomic bomb. Only true faith is like this. It really is, and you must see it this way, or you won’t see Faith properly. The Bible says God created the entire Universe by Faith. It’s how He’s going to create the next one. Faith is powerful stuff and you and I only need a drop of it. Jesus said you could move mountains with a mustard seed amount of Faith. Well if you’ve ever seen a mustard seed you could fit a dozen of them into most drops. Now there is an element of Faith that is like a tool, and you need to use the right tool for the job. Meaning, if you need Healing then you have to Feed on the dozens of Scriptures that speak of and promise Healing, and so on – for every different need. Financial, physical, wisdom and insight, strength and strategies. The Bible covers all of it. The way to get healed is the same way you got saved, by Faith. Your salvation is based on Scripture, these other Scriptures are for every one of us just as much as the ones that save are for us. People just haven’t been trained in them. The Bible itself tells us that we are to be Trained in and with the Scripture. You know who does that in the Body – Teachers. They are the ones God has Called to do it. I’m teaching you right now, that’s my part. Your part is to stay Teachable. Because the tendency of our flesh is to get offended, which makes us unteachable. So we saw that there is an element of Faith that is like a tool, but there is more than that. Faith is also a Relationship. God is in the Faith that He gives us, just like He is in His Word. Don’t try to wrap your head around all that, listen in your spirit. That is the only way you will ever get Spiritual Things. Spiritual is not Intellectual, your spirit is above your Intellect. It is in your spirit that “you know all things“, right. That’s what the Bible says. In your spirit is where you recognize Truth, that’s what that verse means. 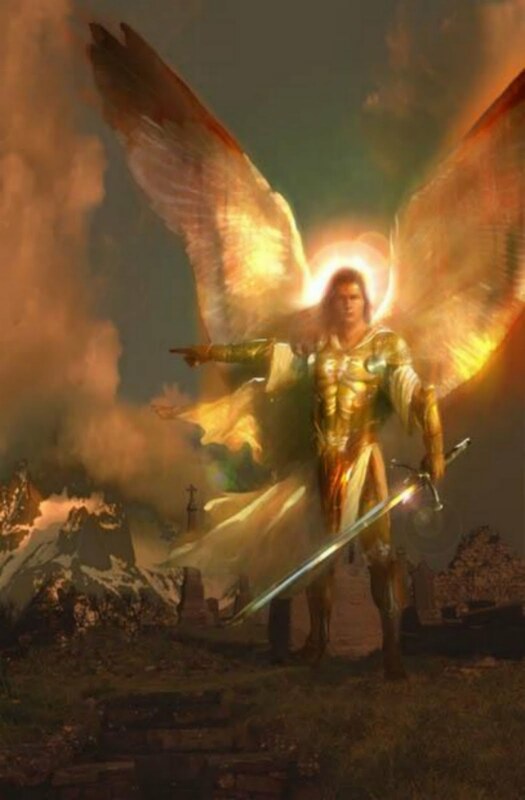 We read in some ancient Hebrew extrabiblical texts that the Devil took some things that God had showed the Archangels, and tried to use it apart from God and [by doing so] used it against God. Whether we believe that or not, that is exactly how most christians try to use what they call their faith – and it is a Failure. They try to use their faith without God and because it’s for their own purposes, they are using it against Him. Faith is not a cold selfish impersonal intellectual thing like that. Modern believers use their faith like it’s some sort of control over God. Like they’re going to control Him into doing what they want. As though He is a genie that will grant them 3 wishes. Faith is not control, Faith is trust. You have to trust Him, and trust that He will do what He said. What did He say. If you don’t know you need to go find out or wait until He does say. It all starts with what He said. We saw that Faith is also a relationship, and that God is in the Faith that He gives us. He comes with it. You cannot just take Faith and go do whatever you want with it. It is only to do what He tells you. You can’t just do it by faith unless He told you to do it. If He did not tell you, you won’t have Faith. You will just be pretending, and it won’t happen. Real Faith brings real results, fake faith brings no results. That’s why so many have no results. Faith doesn’t begin with Miracles, Faith begins with Hearing from God. That’s why you cannot separate Faith from being Led by the Spirit. His Word and His Spirit are the two main ways we Hear from God as Individuals. Faith is our assignment from God and He will not do it for us. If our faith fails we will not make it to Heaven. Grace is an assignment God has given Himself, and we cannot give ourself grace for Him. Not a single person is in Hell because of a lack of grace. They either lacked the faith to get saved or had their own personal faith in the wrong things. To not do anything to build your faith, then presume you have strong faith is not faith. It is deception and it is a sin. We all have a life and most of us want to hold onto the life we have. God does not want that, He wants us to trade the life we have for the life He has for us. Doing this trade in the sense of walking it out is called faith. Faith is the only way to get that life, there is no other way. Most who believe in the God of the Bible do not want Him to apply the Bible to their life, they only want Him to help them with the life they already have. He will never do that. If we saw God we would never say that, we wouldn’t even think it. Only those with faith will see Him. Faith is not having a philosophy and faith is not being religious. It is not either of those things at all. If you don’t already know the something other that faith is as God defines it and as God requires it, then for you what you call faith is one of those two, and it will never work. Faith is not agreement and faith is not another word for your belief system, or any belief system. You have heard the word used that way and are very familiar with it, because the world uses it that way. But the world and the Bible are completely at odds and always have been. Faith is something spiritual, and like all things spiritual it does manifest in the physical. But the manifestation is not faith, it is the result of faith. True faith. The fake faith spoken of in the Bible doesn’t manifest anything, that’s why so many fall away from it. Faith is a living trust in the God you know. Every word is significant. Faith begins where the Will of God is known. If you don’t know God’s Will for a thing, you won’t have Faith for that thing. Faith is not mental, it is spiritual – and it’s Powerful. Faith is like a Tool, but it’s also a Relationship. You cannot separate Faith from being Led by the Spirit. They go together. You could pray for [someone else’s] Healing from Scripture alone, but you would be forgetting the relationship part. I’ll give you one example of the many miracles available to anyone, that happen in our Ministry regularly. For years. As the head of an international ministry, one of my tasks is to send 2 of our Preachers out at a time to Africa to minister at our 7 Churches there, in the Rift Valley of Kenya. Usually twice a year. I could have told them to lay hands on the people and pray for their Healing ahead of time, but I did not. Not until our 2nd trip out this particular year, AFTER I heard in my spirit from the Lord that He wanted us to do it. I had Pastor Anthony who oversees our International Ministries contact them while they were out there and give them my Instructions. Our men out there did What the Authority told them When they were told – and Bam! Multiple instant miraculous Healings. Huge growths coming out of women’s stomachs disappeared in seconds! Look at God! We do What God tells us When He tells us – and we get results every time. You do what You want when You want, you’ll get nothing, and it will hurt your faith. Every time. Many people think to themselves if I can’t understand this then I cannot be alright. I have to figure out what’s going on or how I’m gonna come out of this. No you don’t. That’s where faith comes in. You do not have to figure it all out to stay in faith and you do not have to understand to stay in faith. You just have to stay in faith. Trust in God allows us to rest before we know how things are going to turn out. Faith is a rest. In the midst of trials persecution and chaos all around, we can be in perfect peace. Because our trust is not in the troubles, our trust is in God. This trusting in God in the midst of the unknown is Faith. Don’t despair, it’s not too late, as long as we’re willing to Change. We don’t want you to be impressed with our faith. This should inspire you to build your own faith. God will do these things through anyone who does what He says. So here’s what I want you to know about Faith. Faith is a Power given in Measure by the person of God to the person who follows God to do Only what He says. If you’ll take all that I’ve said about Faith here and apply it, it will start working for you. To bring about God’s Will in the earth and in your life. His Word guarantees it. You do not have the right to say you belong to Jesus but you don’t belong to the Church. The true Church is the Body of Christ. You have to get Fed somewhere, and you don’t get to pick and choose. Don’t treat His Body like it’s some sort of buffet or supermarket, it’s not like that. Jesus is a King. Not a commodity. If you’re under the King you’re not part of a democracy, you’re part of His Kingdom. He has already ordained the people and places where His Body gets fed in His Kingdom. The various parts are where He puts them, not where they put themselves. This is a real living Body, not some children’s game. His Spirit will lead you to, and confirm who and where you’re supposed to be joined, but you have to learn how to listen. Everybody has to learn. Most people refuse to, including most believers – they don’t want to. They’d rather have it their way, not do what He say. It’s too difficult . . . for their Flesh. God has certain things He will only get to you through Ministers in the 5 different Offices of ministry. People chosen by Him. They are there expressly for the reason and purpose of Authority, which you must get up under. Your Flesh will avoid this at all costs. It hates being told what to do. If you don’t kill your Flesh, it will kill you. This hatred of authority and the rebellious nature that birthed it, came with the Fall of Man. Authority is the very thing that was rebelled against, and the thing that must be submitted to. The fallen nature of our Flesh will not do it, it is Incapable. That’s what the Cross is for, to crucify your Flesh. Jesus said to carry it. It does burn your carnality, but you can burn now . . . or burn later. The Bible speaks of Imaginations that exalt themselves above the knowledge of God. We are commanded to cast them down. Well where are these Imaginations at. They’re not just in demons and the atmosphere, they’re in everything that is Fallen. These wrong hateful rebellious Imaginations are in us. When we Fell we became like the one who made us Fall. Accepting what Christ did changes the core part of our Inside, but it doesn’t change us entirely. That gets done through a process of belief and obedience called Faith. Which is our personal job to walk out. Not something to agree with. It is entirely our job to identify these wrong heart postures and wrong ways of thinking within ourselves. No one else will or can possibly do it for you. God set it up that way. We have to choose. Choose to believe, choose to read the Bible, choose to obey it and therefore Him. Choose to stay. He only wants those who stay. Choose to submit ourselves to His Will every day. Which is expressed through His Word, His Spirit and His Ministers. And they all agree. You know how we can tell – they all say the same things. If we all don’t learn to say the same things, it’s because we don’t Agree. We wanted something more than we wanted Him. We were all born into disagreement, we must put ourselves into Agreement – through Submission. There is not some other way.